'Beautiful Things' Is A String Of Little Apocalypses Almost every story in Simon Van Booy's bitter, tonic new collection is about the end of the world — or if not the world, then a world, whether it's a failing relationship or a dying family member. 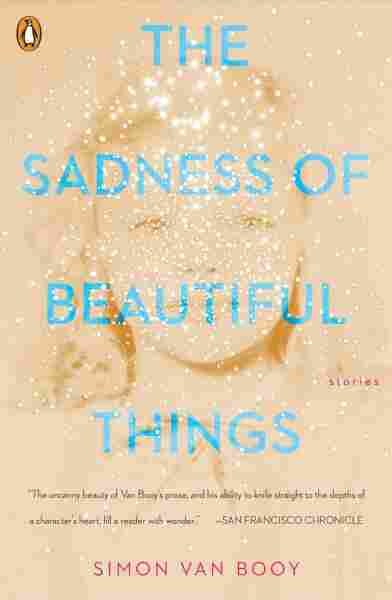 Every story in the slim new Simon Van Booy collection, The Sadness Of Beautiful Things, is about the end of the world. In none of them does the world actually end. In none of them does it even come close. But that doesn't change the fact that these are stories of apocalypse. Even the quietest of them shakes the ground and darkens the sky. They are stories of tiny cataclysms and small annihilations. Eight of them, mostly very short, one of them tickling the borders of being a novella (complete with 28 small chapters and an author's note that is mildly haunting in retrospect). "A Sacrifice" is about a house fire where the burning reveals a deep, personal secret. "The Green Blanket" is almost science fiction. Maybe magical realism. It's about an alternative explanation for aging, memory loss and melancholy, and a Chinese doctor who can cure it (change it, alter it) with magical glasses. "Playing With Dolls" is definitely sci-fi and centers on a question that has been asked a hundred times before, in a hundred other stories: If you had the chance to replace a dead child with a perfect robot version, would you? And okay, so what if your child wasn't actually entirely dead? In "The Saddest Case of True Love" Van Booy uses the frame of an unexpected postcard to tell the story of a father dying — which is the end of one world, certainly. One small and distant and conflicted world, as the narrator relates the story of the man's daughter (who he met one night by chance on a trip to Italy) and her experience of the boundaries of love in an abusive, illicit relationship. In Haunted 'Florida,' The Storms And Panthers Are Always There. How Will You Survive? Nothing ends in "The Pigeon," I suppose — but I'd forgotten that odd little story about a boxer buying dinner for his would-be mugger was in the book at all until I checked the table of contents again. "The Hitchhiker" is about the end of youth, of innocence (maybe, if there ever really is such a thing) and of one special night when two lost people find each other at just the right moment. These are melancholy stories. Bitter as tonic. Sometimes thin, always jagged, they're like swallowing barbed wire; they hurt you from the inside. But in their form — within their structure and limitations — Van Booy works an unusual trick of transubstantiation. In moments, in glances, in tiny flutterings of description ("There were rocks near the water's edge, like molars from the mouth of an old god.") he makes the world beautiful in its awfulness. He finds the expressions of sweetness or light in darkness, captures the precise weight of exhaustion in joy when it comes to those who have learned how rare and precious happiness can be. And how fleeting. Quietude. That's what Van Booy understands. The spaces between words. The silence at the end of thoughts that sometimes take decades to form. How one night can last longer than any year or lifetime, and mean more, and be held more dearly. "The world might not end, but they would. And that was the forever part. Not love. Love was just something tiny and bright with eternity on all sides." That's from "Not Dying," Van Booy's longest, most developed, most unusual story. And the words are from Lenny, its only real character. A husband and a father, whose wife and daughter are asleep upstairs on a night when Lenny thinks the world (the actual world) might be coming to an actual end. That all of it might end in fire. It is a story that is both claustrophobic and expansive — happening in a snowstorm, in a small, isolated cabin, but encompassing lifetimes, childhoods, memories, love and disappointment. Lenny's panic grows and it becomes an embrace, enfolding you as you read. His fear the same. His powerful love for his family, even as he considers worst cases, mercy, death. ... what Van Booy seems to be saying (over and over again) is that that one moment, that one night, can be enough to carry you through the darkness. No one has ever had a night like Lenny's night, except that, really, we all have. The one where you couldn't sleep. Where you knew something terrible was coming. When you considered doing the worst things imaginable. When the world — whatever your world was then — seemed to be crumbling around you. Van Booy can give you back that night, sketched in short, sharp strokes, pitiless in its emotion but gorgeous in its evocation. "They were at the mercy of flesh and bone. Things he could not comprehend would never be greater than his daughter's hands, his wife's hair on the pillow at night like black rivers." The end of "Not Dying" will gut you. It'll sneak up and catch you unaware if you're not careful. And while not every story in Van Booy's collection has the power of this one, each story has a piece of it. An acceptance of loss. An understanding of love. A memory of when everything was right and good, even for just a moment, even for just one night. Because what Van Booy seems to be saying (over and over again) is that that one moment, that one night, can be enough to carry you through the darkness. That maybe that's all any of us should expect. I don't know if I agree. But I know I liked listening to Van Booy make his case.